Heads Up. New Beautiful Fabric alert! Here we go, into a new year and all the hopes of what the new year brings with it. I have so many ideas, plans, and dreams that I want to share. It is going to be a GREAT year for us, fellow stitchers. First, I'd like to explain where the name 'The Princess & The Peddler' came from. Well, I was very interested in genealogy several years ago and after much research, I discovered that my 18th great grandfather was 'King Robert the Bruce'. You know, the one that Mel Gibson was fighting for in Braveheart? So, hence the 'Princess'. My husband who has worked in construction sales for years is 'the Peddler'. Tah-dah! And here we are! I wanted to give you all a 'heads up' about some really unique counted cross stitch linen that I will be offering in late January. This is a 30 count linen that has been aged and then words are professionally and faintly printed in a very stylish font. It is stunning, isn't it? This is a special order, coming from Europe. If you want to be sure to get yours, please visit the the website and place a pre-order. You will find it under 'Shop Online' - 'fabrics' or 'all'. The linen will be approximately 8.5 x 13 and is priced at $18.00. There will be limited quantities available. If you choose not to pre-order, you will be in danger of not having your cross stitch project completed on this beautiful fabric. 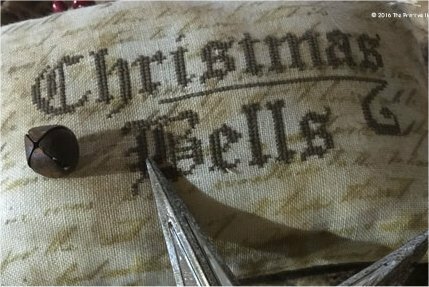 If you are interested in stitching 'Christmas Bells' on this fabric, the free chart, courtesy of The Primitive Hare, on my Facebook page.